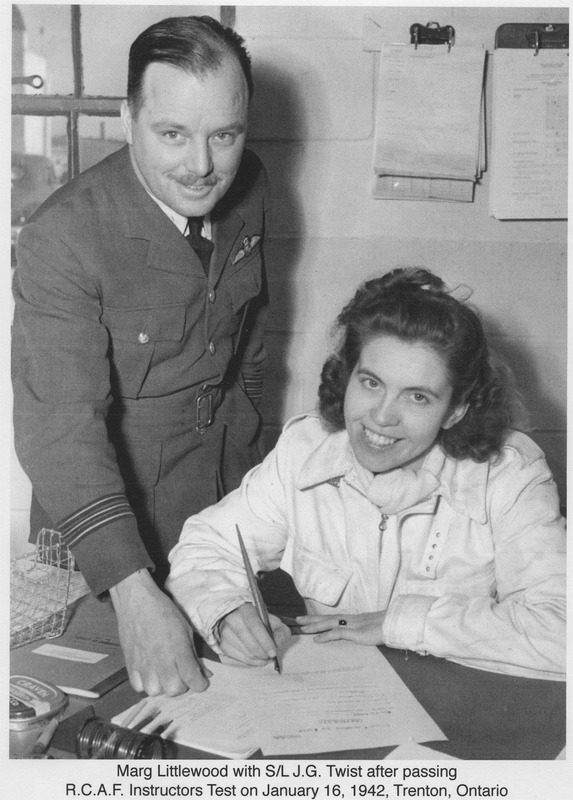 Our second Commonwealth Air Training Plan Museum video oral history features Winnifred "Winnie" Field. Winnie was born and raised in London England. She joined the British army as a young woman during World War II. In the video she talks about the beating London took from the infamous German V1 and V2 flying bombs and how she, and her brave friends and neighbours dealt with this threat. Also, she talks about meeting her husband who was posted to England with the Canadian Army. After the war, she emmigrated to Canada as one of those famous war brides who had to deal with the culture shock of learning to appreciate living with a new family in a new country. Her story is touching and humorous. In World War II, thousands of men, both civilian and enlisted in the air force, provided valuable training at all levels to over 131,000 students from the air forces of British Commonwealth countries. 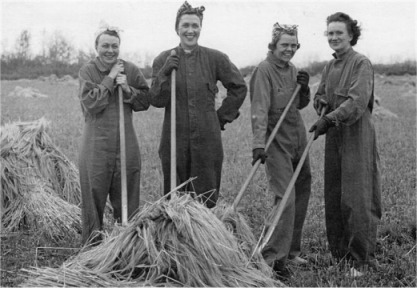 Women were encouraged and recruited as civilians and air force staff into dozens of different trades in the Commonwealth air forces so that men could be released to take on combat roles. 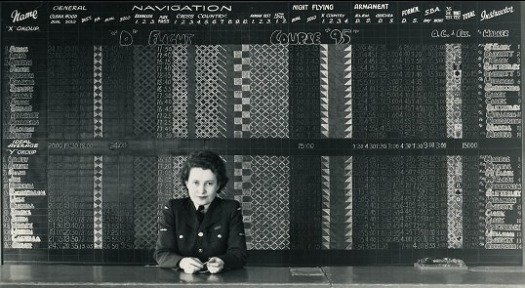 Although they were trusted in many jobs, women were not allowed to be instructors in the British Commonwealth Air Training Plan. One woman managed to enter and find success in this world exclusively allowed to men. Margaret Littlewood was that woman. She started her career in aviation as a flying instructor at Barker Field in Downsview Ontario at the school where she earned her flying licenses. In 1942, civilian flying schools closed down when fuel for aircraft became unavailable because of gas rationing. Out of work, Littlewood applied for work at the 10 Air Observer Schools in the BCATP located across Canada. A stroke of luck was delivered to her when World War I flying ace and manager of No. 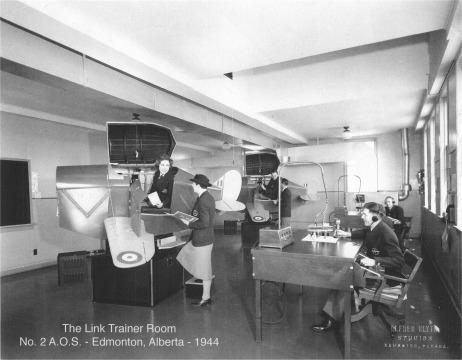 Air Observers School in Edmonton Alberta W.R. 'Wop' May asked her take an open position as a Link Trainer Instructor. 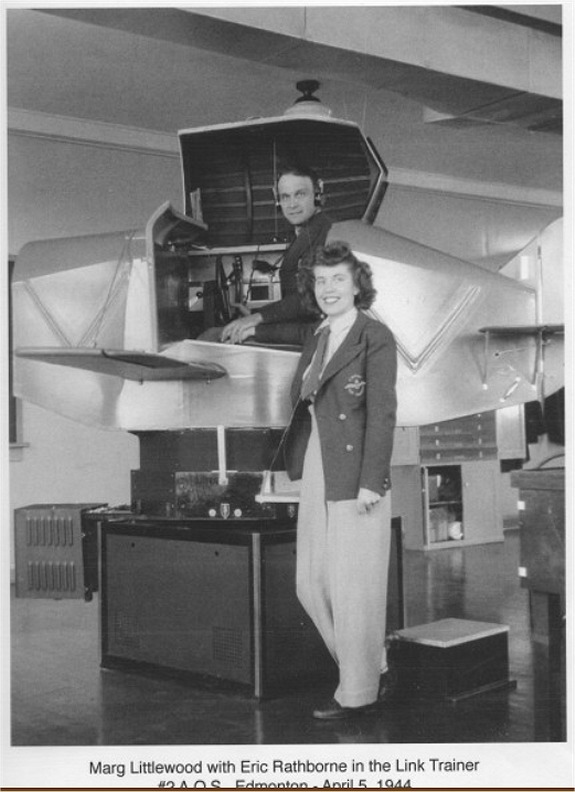 At that time, the Link Trainer was a sophisticated flight simulator used by the air force to give flying experience to new students, especially with instrument flying procedures. 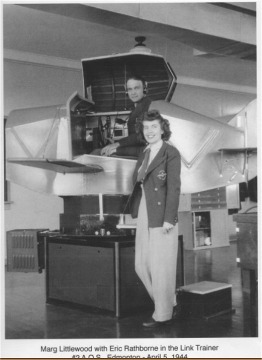 Littlewood came into this job with absolutely no experience with the Link Trainer but by watching other instructors on the job and the recording equipment on the Link’s control desk along with experiencing flying with her students, she quickly caught on to the job and became very proficient. While working at No. 2 AOS, Littlewood was offered additional Link training duties with the Royal Air Force Ferry Command Centre in Dorval Quebec. In the three years she was in this job, she logged over 1200 hours of instruction time with 150 students at No. 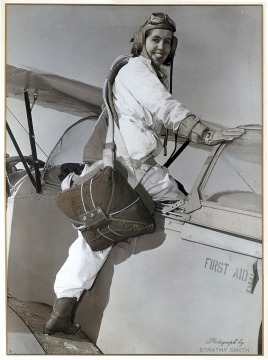 2 AOS..
After World War II, she continued with aviation by completing all three levels of the commercial pilot license training – one of three women in Canada to do so. In 1954, Margaret joined the Canadian Ministry of Transport where she worked until 1980. 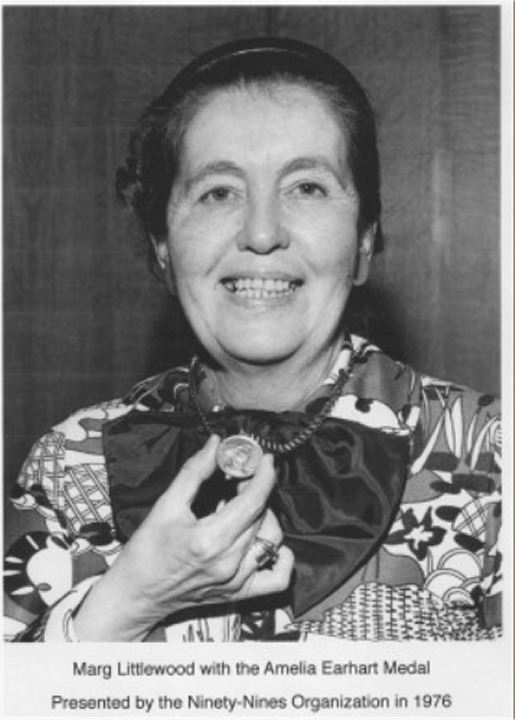 In 1982 she was awarded the Amelia Earhart Award by the `Ninety-Nines’ international organization of women pilots for her pioneering achievements in advanced flying training. 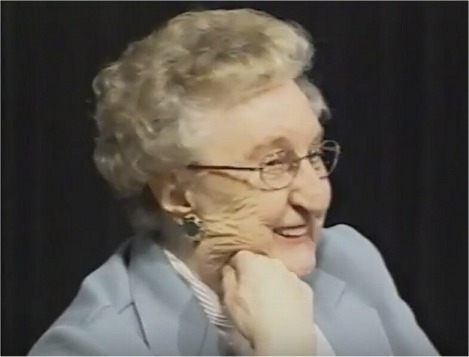 Margaret Littlewood passed away on February 5, 2012 at the age of 96 years. Featured here are some photos of Margaret Littlewood at work as a Link Trainer Instructor for the British Commonwealth Air Training Plan. We previously saw an example of the Commonwealth Air Training Plan’s Harry Hayward’s work in our Canada 150 Vignette No. 019 where we used information from his Station Report project to reveal a special day at No. 7 Bombing and Gunnery School in Paulson Manitoba. He continues his good work interpreting British Commonwealth Air Training Plan Station Reports gleaned from microfilmed official Royal Canadian Air Force reports. Harry is currently working on the reports for No. 10 Service Flying Training School in Dauphin Manitoba. 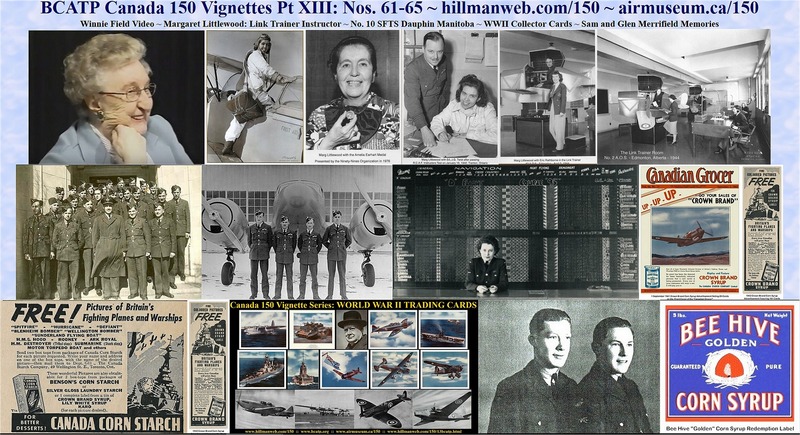 We present a portion his work – a couple of months in 1941 which deals with the opening of that school and the subsequent difficulties connected to the opening -- staffing, the weather and essential base facilities. Although the writer of the reports is unknown to us, he was definitely a literate man using some fancy words in a type of report that generally isn’t flowery and injecting witty remarks which humanizes the situations he describes. Enjoy Vignette No. 63 – No. 10 SFTS Station Reports – Dauphin Manitoba. 15-2-41 Officer made shift for breakfast and lunch by means of a hot plate in the batmen's room. Sewage disposal plant and sewer system not yet completed. Will probably be end of February before these services ready for use. Only water available for washing and cooking must be hauled in tanks. Sanitary "conveniences" (?) of the most primitive outdoor type. 16-2-41 Several unofficial complaints of chilblains, account outside "sanitary" conveniences and temperature 22 degrees below zero, and not conducive to comfort under such circumstances. 20-2-41 Water and sewage systems still not available for use. 22-2-41 Still no sanitary facilities available. Large airmen's Mess put into service, and airmen vacated Sergeant's Mess which was being used temporarily. 23-2-41 Routine normal. Voluntary church parades held to various denominations. Strong winds and drifting snow. Snow plough out cleaning airport roads. 24-2-41 Heat turned on in No. 5 hanger and Command H. Q. notified ready to receive aircraft. Furniture for Officers' Quarters beginning Three stenographers, grade one, Civil Service, taken on strength. These are the only available stenogs-Civil Service- available in Dauphin. Organization of Orderly Room badly hampered by lack of clerks, only two service clerks posted this unit at this time. 25-2-41 Start made in getting canteen into operation. 27-2-41 One hundred tables and four hundred chairs supplied by breweries for use in wet canteens, also refrigerators for canteens, officers' and sergeants messes. Twenty-five second hand commodes, equipped with fume pipes, arrived - - " a feeble effort to relieve the discomforts of the medieval backhouses at 30 below zero. Authority brought back by C. O. to have additional female orderly room help from non-civil service stenogs available. Choice of experienced help very limited. 28-2-41 One more Orderly Room clerk reported for duty. Still no clerks available for Squadron Orderly Room. D. A. P. S. wired urgently to post at least three experienced N.C.O. clerks. Feb. 28 Training not yet commenced. March 1 1941 Water turned on in barrack blocks one to four inclusive for washing and showers only. March 2 Canteens-wet and dry- opened for first time at 1600 hours, with a small initial stock. Purchases, as far as possible, being made from local business firms. March 7 Eleven women stenographers now taken on strength. Squadron Orderly Room personnel extremely limited, no N.C.O. clerks available. Water for washing purposes turned on in the Officers Mess. March 8 Slight thaw set in bringing thick gumbo mud in its wake. Crew set to work making scrapers for entrance to buildings. March 10 Shower baths at last available in the Officers Quarters. Toilet facilities still of the most primitive type as sewage disposal plant not yet completed. March 11 Received 20 additional parachutes, making a total of 30. Lack of chutes has contributed to delay in getting flying instruction under way. March 12 Water turned on in G.I.S.- - for washing purposes only. Routine normal otherwise, although still a great shortage of General Duties personnel. Must employ ex-war veterans as messman, batmen and possibly as hanger G.D's. March 14 Water turned on in Barrack Blocks Nos. 5,6 and 7. Outside toilets still "the mode". Sanitary engineers arrived to check on sewage disposal plant. All fervently hope they'll give it an "O.K". Primitive backhouses very discomforting. March 17 Services of the fire engine had to be called in to aid pumps at the sewage disposal plant. Although the plant only handling waste water from the showers, and practically no sewage, regular pumps proved inadequate to handle the discharge alone. March18 Backhouses abandoned and nobody has any regrets. Toilets in barrack blocks cannot be used yet. March 19 Three civilians taken on as messmen due to shortage of G.D's for kitchen help. March 25 Number of ex-service men taken on as civilian messmen, thus relieving, to some extent, the serious shortage of General Duties personnel. March 27 Thawing and muddy during the day. Additional civilians-veterans- engaged for duties in kitchens. March 28 Thawing all day. The mud is terrific,- - ankle deep and as affectionate as a love-sick sweetheart. Walking is agony, it clings so. In D.R.O. of this date was the gladsome news that the toilets in the Barrack Blocks may be used for the first tine Sunday, March 30. No more outdoor backhouses. It is hoped the sewage disposal plant keeps on disposing. March 29 Weather fine and warm. Snow disappearing- - mud appearing. Runways covered with slush by early afternoon. March 30 Flaps on five Harvards damaged due to slush on runways. Repairs delayed due to lack of material. Photographic section inoperative due to lack of equipment and supplies. Diffusion plate on enlarging camera broken when received. No films or printing paper received and only part of chemical ingredients for developers and fixing bath. April2 C.O’s inspection showed Barrack Block 4 in very dirty condition and empty beer bottles found in the block. Whole block confined to camp for 7 days. April 5 Dauphin Little Theatre Association put on the first show in the Recreation Hall. Quite successful and enjoyable. About 60 girls from Dauphin came out for the dance which followed. Mud terrible, and walking in it even more terrible. However, all seemed to enjoy themselves in spite of the gritty floor. April 6 It is just one month since flying training started and already this Unit is 13 days ahead of schedule with course No. 22. April 7 Caterpillar tractors around this camp have come to be known as "Tugs", Half their time seems to be spent in towing bogged trucks out of the deep, gooey mud. "Plugstreet" is the nickname now given to the road from the Administration Building to the Officers' Mess. Trucks using this road all day long have churned it into an affectionate morass that recalls the muddy mess of Flanders. Bogged cars, floundering officers struggling through knee deep squish, and occasionally sitting down in it, are typical scenes. April8 Mud gets thicker and deeper. Walking on the "roads" becoming a perilous undertaking. April 10 W & B (Works & Building) Section procured several carloads of cinders in an effort to make muddy roads passable. That's about all the roads are at present. April 11 W & B crews busy trying to keep bottom from dropping out of camp roads. All truck traffic banned, except for absolute emergencies. Tractor and stoneboat used for camp hauling. April 12 All traffic on camp roads stopped except big tractor hauling stoneboat. Station Photographic Section still inoperative, No film or paper supplied yet, although specially indented for. Cannot use enlarging camera because of broken diffusion plate. Replacement asked for a month ago. Pictures of crash had to be taken with a private camera. April 13 Roads awful because of mud which is knee deep in places. April14 Disappearing snow has revealed piles of debris all over the camp, left by the builders. Fatigue parties busy all day in an effort to get things shipshape for tomorrow's official opening ceremony. Terrific task because of the mud. Nearly impossible to keep buildings clean for five minutes at a time. Movies shown for the first time in the Recreation Hall. April 15 Weather C.A.V.U. Today this station was officially opened, with appropriate ceremonies, by Air Commodore A.B. Shearer, A.O.C. No. 2 Training Command. About 2500 residents of Dauphin attended. The A.O.C. arrived by plane at 1115 hours, accompanied by F/O McLennan, personal aide. Opening ceremonies commenced at 1430 hours when the A.O.C. cut the ribbon which opened the path for a Harvard flown by S/L R.E. DuPont in an exhibition of aerobatics. The A.O.C. told of the development of the Joint Air Training Plan and the part #10 S.F.T.S. will play. Prior to the opening ceremony the A.O.C. inspected a guard of R.C.A.F. personnel and a company of the Dauphin Veterans Guard. Afterwards the civilian visitors were shown over the station. From 1600 to 1800 hours a number of invited guests were entertained at tea in the Officers' Mess. In the evening an informal dance was held in the Officers' Mess. The band of No. 2 T.C. played during the afternoon, and the orchestral section for the dance in the Mess. Visiting aircraft were Beechcraft B.M.U. with A.O.C, Boeing with band and Lockheed with the visiting flight from Trenton. The new fireplace in the Officers' Mess was used for the first time, the A.O.C. lighting the first fire. April 23 Shortage of tail wheel tires reported reducing the number of serviceable aircraft. April 25 Sun and wind drying up the mud. Compactors and graders busy on the roads. May 1/41 Harvard 3025 crashed in a forced landing. Makes twelfth accident since station opened. May 4 S/L G. Sellers of No. 11 S.F.T.S., Yorkton, Sask. landed with 7 other machines at 1330 hours. He informed the C.O. there had been a collision in mid-air near Lake Audy. Tail Section cut off one plane which crashed. Other plane landed here with prop and wing damaged. Search party organized and found wreckage in two sections 2 miles apart. Pilot of 11 S.F.T.S., dead. May 6 Weather turned raw and cold. Fires have been out since April 30 on instructions from Command. Quarters and offices cold and damp. Even sheets on the beds were damp, but still no warmth in buildings. Temperature down to 49 degrees at 2030 hours. Several makeshift hot water bottles cane to light as personnel tried to keep warm in bed. May 7 Heating units in station buildings turned on again at 0900 hours after temperature had dropped during the night to 38.5 degrees. A little more comfortable now that the heat has been turned on again in the buildings. May 8 Spring is in the air, and the urge to beautify in the ascendant. Appears to be keen gardening competition on among hangar crews and occupants of barrack blocks as to who will have the neatest and most colorful gardens in their respective areas. May 10 A civilian employee working on the field, ducked and fell on an axe he was carrying, cutting a gash in his arm when a Harvard swerved off runway. May 12 Weather clear. Flying all day. Six tail wheels blown out today. 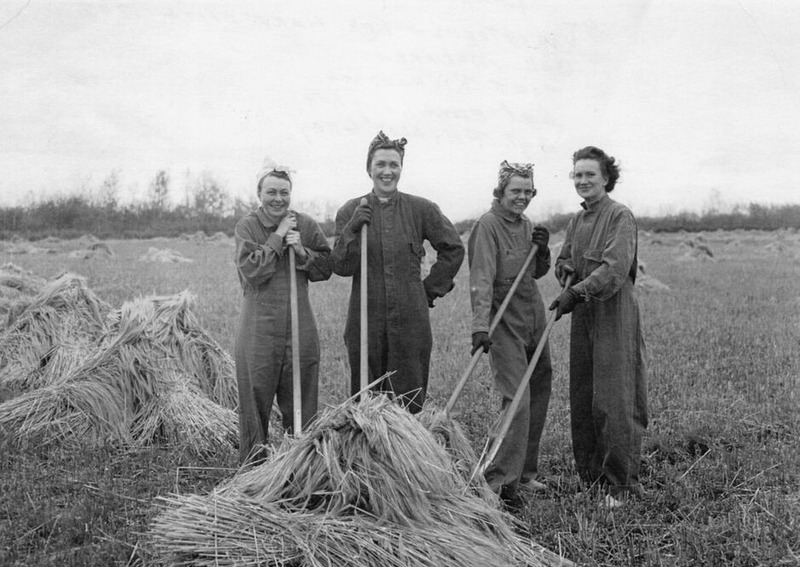 May 13/41 Mr. Tinline and Mr. Good of Brandon Experimental Farm here to arrange for seeding of the grounds. May 14 Getting colder again. Overcoats needed in offices and hot water bottles in bed. Heat shut off and buildings like refrigerators. Temperature down to 38. Everybody shivering. (Sniffling noses are the order of the day). Heat turned on again at 0900 hours. May 16 Four Chesterfield sets for various Messes donated by T. Eaton Co. Branch at Dauphin. It was decided to purchase others for the Canteen and Library from Canteen profits. Shortage of tail wheels. Seems very difficult getting equipment depot to part with them. Six ordered by LPO from Toronto and delivered from manufacturer in two days Six only were received from the depot on Demand No. B 57 which demanded 80. May 17 Wing tips are "getting it in the neck" these days. Another damaged on Harvard 3773, tried to land too high up. May 18 Five new Harvards flown in from Winnipeg, No seat harness or identification lights in then, so cannot be used for either day or night flying. Some use, however- -at least their tail wheel tires are being used to make other aircraft serviceable which were short of such part. May 23 Two accidents today. Nobody hurt. Must be a lot of spare horse shoes around, everyone seems to be so lucky. Student pilot in Harvard 3783, low flying in Fisher River area–46 miles north. Struck a backhouse in the Stony Creek school grounds with his port wing. Aileron and 7 feet at outer end of wing torn off. Backhouse disintegrated. Pilot managed to fly back to the aerodrome minus aileron and half of wing. Made a perfect landing. Two charges laid against him of low flying and endangering life, under A.F.A. Sec. 39A (1) (e) and one under A.F.A, Sec. 11. May 24 Student pilot was killed when his plane, Harvard 2943, spiralled into the ground at 2330 hours while on solo night flying practice from the relief field. The aircraft hit the ground about two miles northwest of the field. There was an explosion and the plane burst into flames. Bolton was killed instantly and the body badly burned. "A" Category crash. Saturday routine normal otherwise. May 27 Overcast skies and cold. Short funeral service held by F/L Littlewood, station chaplain. Six Leading Aircraftsmen acted as pallbearers and escorted body to the train for shipment to Toronto. His Honor, R.F. McWilliams, Lieutenant Governor of Manitoba, visited the Station this afternoon accompanied by prominent local citizens. Toured Station and were guests at tea in the Officers' Mess. May 28 Course 22, the first from this school to graduate, received their wings today. The presentation was made by the Commanding Officer, Wing Commander A.H. Wilson. The ceremony was held in the Drill Hall and was attended by friends and relatives of the graduates. As he pinned the wings on the breasts of the recipients, the C.O. addressed a few complimentary remarks to each. Afterwards he addressed the class as a whole. Presentation of wings should really be regarded as the beginning of their careers as pilots, he said, and exhorted them to keep open minds and continue to learn. Following the presentation the parade marched past in column of route, the C.O. taking the salute. LAC Daniels wired the C.O. from Centerville, Kansas: "Sir, will arrive a few days late" for course 29. Very nice of Mr. Daniels. Course 29 reported today for training. May 30 Pay Parade held for all ranks. Normal routine otherwise. Clocks turned back one hour new Station time. June 13 Course 25 Examination List posted. Forty-nine passed, two failed. Two fatalities in this course. Seven pupils washed out during the course. June 16/41 51 New Zealand Trainees reported for Course 31. June 21 Course 25 graduated and received their wings today. Group Captain D.W.F. Bonham-Carter made the presentation, addressing a few words of congratulation to the graduates individually as he pinned the wings on their breasts. At the conclusion of the ceremony the Group Captain addressed the class as a whole. He exhorted them to be cautious and not to take unnecessary risks but not to hesitate to take whatever risk arose in their line of duty. He wished them Godspeed and good luck. Thirty-two of the graduates were posted overseas and seventeen to C.F.S. Trenton for further training as instructors. June 23 One of the cross beams in Hangar 4 reported cracked. Shored up. June 24 The afternoon at which the Court Martial sentence of a Sgt. Pilot was promulgated. Five squadrons were drawn up in a hollow square on the parade ground while the sentence was read by F/O J. Sinclair, station adjutant. The Sgt. was severely reprimanded and awarded $75.00 deductions of pay. Today a carload of lumber for duckboards arrived. Very ducky. The material was ordered during the gumbo period in the spring for immediate use. Anyhow, it will be handy next spring to alleviate wallowing conditions. June 25 Ice cream dispenser installed in canteen. Pop sales increasing by leaps and sounds with hot weather. Canteen committee voted to donate sum equivalent to 1% of gross sales monthly to R.C.A.F. Benevolent Fund, but reserved right to discontinue the donation at any future tine. Routine normal. June 26 Weather C.A.V.U. and hot as the hobs of Hell. June 27 Pay parade held today. June 28 NZ student. made three take-offs with flat tail wheel tire. Came in and announced he couldn't savvy lack of control on the ground. July 1, 1941. Dominion Day; everybody working. July 2 Rainy weather last week, which stopped flying, led to two cars of gasoline being cancelled today--too much in stock and on the way. Having difficulty in keeping things running due to lack of General Duties. Now 132 short of establishment. Records say little hope of posting any yet. Supply of suitable civilian replacements also diminishing. Enlisting "Old Sweats" as G.D's one solution. Mosquitos have raised Hell with comfort at night in Airmen's Barrack Blocks. During the recent hot spell somebody busted the fly screens to get more air at night. Result "Skeeters" blitzkrieged the sleepers. Some brainy wag conceived the idea of a smudge pot. Used the disinfectant footbath, with rags and paper in the middle of the room. Smoke beat both Skeeters and sleepers. The latter soon abandoned the Barrack and slept on the grass- -despite even more Skeeters. July 3, 1941 Shipment of five more cars of gasoline cancelled because of recent bad weather. Storage tanks full. July 4 Weather dull and muggy. This Unit's first case for detention barracks came up today. AC2 under going detention, refused to appear for detention drill. He was awarded a further 21 days detention in Fort Osborne jail. July 6, 1941 Group Capt. Izatt and S/L Gilkison of the R.N.Z.A.F. arrived and spent the afternoon inspecting R.N.Z.A.F. personnel in training here. Fifty-Two R.N.Z.A.F. trainees for Course 33 reported for duty. July 8 Arrival of reinforcing steel ended delay in construction of W.&.B. section. Had been held up for three weeks. July 9, 1941 Two more students washed out as pilots. July 10 A fire occurred outside heater room of Barrack No. 2. Apparently started from hot ashes removed from the jacket heater. Damage estimated at $10.00. Fire department did good work in immediately quenching it. July 11 Landscaping of grounds about finished. The job now is to coax the grass to grow. Seeding was late, resulting in poor germination- - of pukka grass- -but loads of mustard. Mr. Brickenden of Department of Health, Ottawa, visited the school. He complained of odor from sewage disposal plant being carried off in open ditch. Odor not exactly rose-perfumed, but no provision made in station plans for costly disposal field. July 12, 1941 Station and interviewed a number of civilian employees with a view to their enlistment. July 14 New course, No. 33, commenced instruction. July 15 F/O Fisher to Neepawa to survey new school site. Pay parade held today. July 16 Canteen staff reported canteen broken into during the night. Door jimmied. About 10 packages cigarettes and $12.60 cash stolen. Investigation in progress. July 17 At last we have received a few more General Duties personnel, 14 of them. That brings us up to a strength of 89 G.D.s as against an establishment of 229. Some job stretching 14 new men to meet all the demands. July 18 Canteen staff completely changed. Continual shortages reported; showing up particularly after month-end stocktaking. Clean sweep of canteen staff may be solution to the problem. Stocktaking carried out this morning, before new staff took over. July 19 Weather C.A.V.U. Hotter ‘n Hell. F/L Huff from Command H.Q. checking on fire hazards. Remarked on shortage of regular fire crew, but can't do much about it with the huge shortage of General Duties personnel. July 21, 1941 The hot devils are dancing on the hobs of hell again. Blistering heat with promise of later electric storm. Visibility unlimited. High wind sprang up-and a hot one, regular sirocco - about 1600 hours. July 22 Weather partly cloudy. Visibility unlimited. At 0105 hours, during night flying exercises, Harvard 3019 had a forced landing. Pilot unhurt, aircraft damaged- -wings, centre section and flaps; undercarriage wiped off. Engine conked in taking off when aircraft about 30 feet off ground. Aircraft narrowly missed boundary marker poles at end of flightway, tore out fence pole, just cleared surface of No. 10 Highway; wheels torn off on lip of 10 foot ditch on west side of Highway. Aircraft skidded on its belly to a stop in a field 50 yards west of Highway, Cause fuel failure gasoline tap not turned to full "on" position. Ten civilian employees of W.&.B. section to Winnipeg for enlistment. Word received here they were being posted elsewhere instead of being returned here. These men have been employed against position on establishment since construction of station first started. July 23 Flying Officer Fisher, W.&.B. officer, contacted C.W.O., Winnipeg, re confusion regarding enlistment and posting of W. & B, civilian personnel at this Unit. July 27 Heavy rain during the night necessitated use of the fire engine to assist pumps at sewage disposal plant in handling heavy runoff. July 28, 1941 T. Eaton representative visited the station and inspected linoleum laid in the various school buildings. July 30 Relaying of linoleum in hospital completed by T. Eaton Co. Routine normal otherwise. July 31, 1941 Works & Buildings section moved into their new quarters. W.&.B. personnel busy picking up crashes for #7 B. & G. School as well as this Unit. Former apparently has no crane equipment. Maintenance section appears to have solved the problem of grabbing brake bands on Harvards. "Finnegan is "off again" for the seventh time. "Finnegan" is the mythical trumpeter this Unit hopes to get sometime - and hopes to be able to keep him. This Unit is entitled to two trumpeters. Has only had one since station opened. D.A.P.S. was asked- -last March- -to post us a second. D.A.P.S. did so, but cancelled the posting next day. On six additional occasions the same procedure --posting and immediate cancellation -- has happened. So, its "off again, on again, gone again, Finnegan". Trumpeters must be more precious than gold. 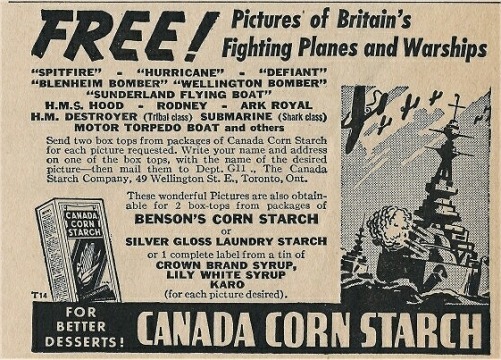 During World War II, children, especially boys, were in love with all things military, This, together with a child’s instinct to collect things sparked a major battle between two of Canada’s retail institutions – the Canada Starch Company and the St. Lawrence Starch Company.They were the dominant providers of corn syrup and corn starch products in Canada, and fierce competitors. The Canada Starch Company was founded in 1858 while the St. Lawrence Starch Company came into existence in 1889 (and subsequently met its demise in 1990). 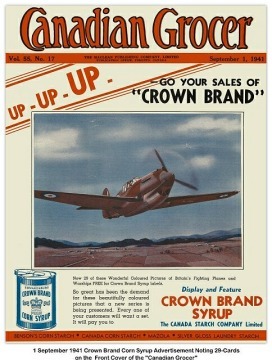 During World War II, these companies engaged in a battle to sell more product aided by a mutual marketing gimmick to attract customers, They offered prizes with the purchase of their products. 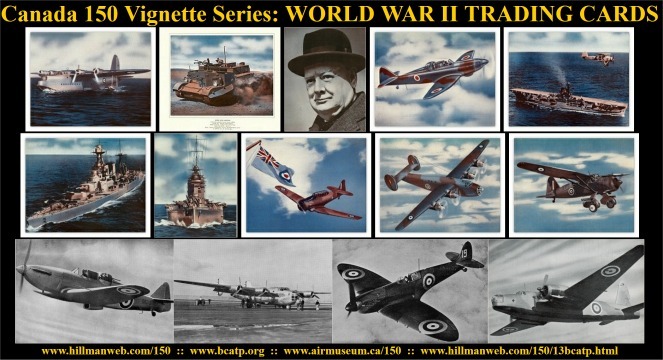 In this case, special sets of military themed pictures/trading cards, primarily of British and Canadian air forces aircraft. This type of competition was not new to these retailers - the race started many years before WWII with first prize offerings being pictures/cards of popular hockey players. The Great Depression brought a new slant to their everlasting competition. The 1930s brought about a full-blown marketing war between the two. Each tried to out-do the other by using the popular media of the time to promote their products. Consumers were inundated with newspaper ads, store displays with giveaway materials, recipe booklets and sponsored radio programs. Creativity can only go so far and the readers and listeners of subsequent marketing campaigns found it difficult to differentiate one from the other. Also, although each company gave consumers `freebies’ to buy their products, the similarity of their brands of syrup and starch allowed customers to use either company’s products interchangeably with no noticeable difference in reults. 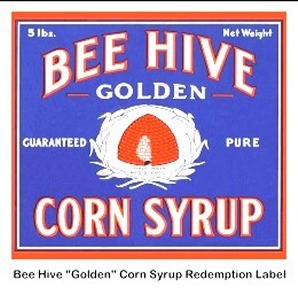 One brand of starch or syrup, was pretty much the same as the next and often the decision to buy a specific product was based on the prize offered with the purchase. The Canada Starch Company, not to be perceived as a retail 'shrinking violet,' followed suit by introducing their Crown Brand of hockey pictures in the following year. Crown Brand hockey pictures were only around for five years while the more popular Bee Hive pictures lasted for 30 years. World War II brought big change to the starch company picture card battle. With many of the best hockey players heeding the call to 'Join Up' hockey player cards became less desirable to the consumer. St. Lawrence company struck first again by offering their V156 "Warplanes" series of 12 pictures of Royal Air Force aircraft in 1941. Like those of the hockey players, the aircraft picture cards were photographs mounted on high-quality matte paper approximately five by eight inches in size. The cards were very popular and by the end of the war, three supplementary "Warplanes" sets had been issued offering a total of 223 distinct cards to collectors. 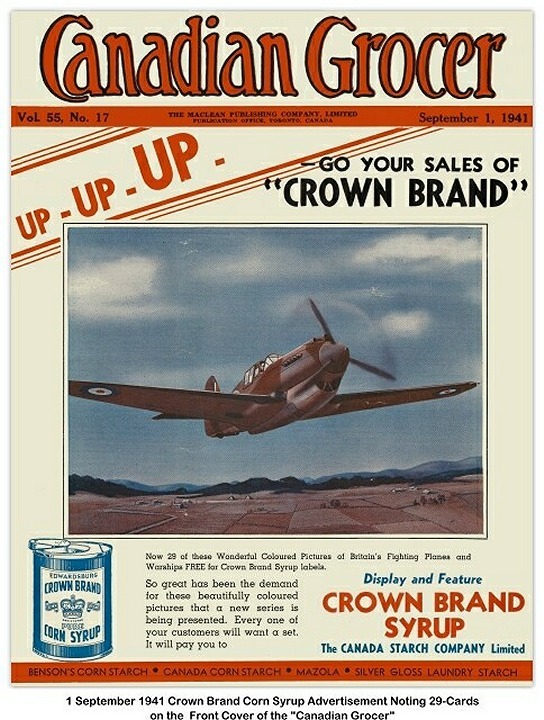 The Canada Starch Co. followed suit by issuing their own set of pictures known as Crown Brand "Britain’s Fighting Planes" in 1941. Trying to outdo Bee Hive again, the Crown Brand pictures, also of similar size and mounted on a paper matte, were paintings and in color. The initial offering was six pictures including the Spitfire, Hurricane, Defiant, Sunderland Flying Boat, Wellington and Blenheim. This offering increased in size of the collection with eight additional picture cards featuring warships of the British Royal Navy. Eventually "Britains Fighting Planes and Warships" offered a total of 29 pictures of which, one lonely army picture -- a Bren Gun Carrier -- made it into the air force/navy dominated set. One further peculiar inclusion was the 30th card, a black and white photo of Winston Churchill. The World War II cards of both companies can now be found now listed for sale on-line in the $20 per card range. This is a major step up from the good old days when a syrup label and letter to the issuing company would get one for you. They were very popular at the time. We can imagine many families with one or more kids pestering Mom to buy more syrup or starch and running from neighbor to neighbor asking for surplus labels. With a total of 253 cards to be obtained, that amounted to a huge amount of pestering and running. 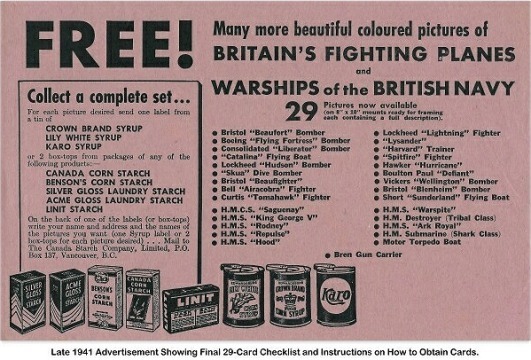 Adding to the great effort required to win these prizes was that table syrup was rationed during the war. This might have required the dedicated enthusiast to broaden label hunting horizons to other neighborhoods and distant relatives. Starch products were not rationed. One wonders how useful laundry starch would be in enhancing this hobby today – who uses laundry starch now?... not popular in a 'wash and wear' society. We offer examples of each company’s art on this page. The Commonwealth Air Training Plan Museum has many of these airplane pictures/cards in the archives. 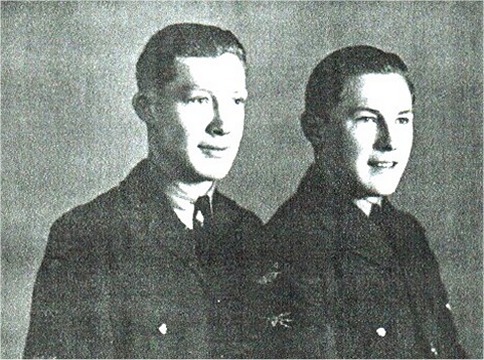 In the first two installments of Sam and Glen Merrifields story, we followed them as the moved from teenage kids on the Canadian prairies through training in the British Commonwealth Air Training Plan and onto deployment as ground crew with the Royal Canadian Air Force in Great Britian. Trained as wireless (radio) technicians, Sam and Glen became members of Canada’s No. 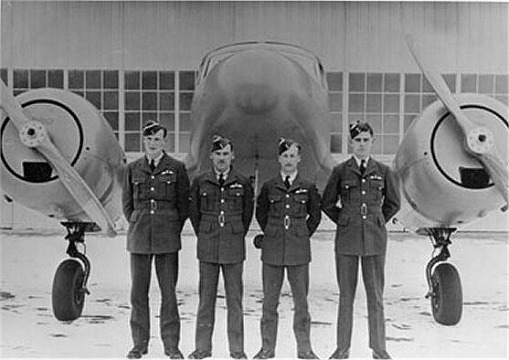 405 Vancouver Squadron, the first of may Royal Canadian Air Force squadrons which when combined became know as No. 6 Group, Bomber Command. 405 Squadron took part in the first bomber raid over Germany and remained with No. 6 Bomber Group until October 1942 when it was deployed to Coastal Command where it carried out anti-submarine partrols over the Bay of Biscay and anti-shipping action against German ships. Settled in, we follow the story of these two Canadian airmen, who with their equally innocent friends in the air force, experienced life as warriors and visitors in a land far from home where much was the same and much was different from what they knew in Canada. Like Marham (England), Driffield was a permanent force base but in the early days of the war it had been badly bombed with the result that there were no doors on the hangar in which the wireless and electrical sections used one common room. When we got there, the highest ranking person in the wireless section was a Corporal named Ford. There was one other RCAF Canadian on the Squadron and also in the Wireless Section named Tom Cranston. There were some Canadian aircrew members who were in the RAF, one being Commanding Officer, Wing Commander Peter Gilchrist. The barrack block in which we lived had half of it blown away by an earlier bombing. When we arrived, there was one aircraft but within a day or two another two arrived and either that night or certainly within a week, the Germans came over one night and dropped bombs on the airdrome and completely wrecked one of our planes and badly damaged another thereby reducing our compliment of aircraft which could fly to one. My brother and I arrived at Driffield in May 1941, the second and third RCAF types to join the Squadron. The 'drome had been bashed about by 50 JU 88's of Eagle Geschwader KG 30 from Norway on Eagle Day 1940 and no repairs had been done. We slept in one end of an H type brick block, the other end was a pile of rubble. These blocks had an air raid shelter in the basement at the center part of the H. At that time the squadron had two Wellington Aircraft, I think both were dual control jobs for training. This particular night we were all asleep and a nearby Ack Ack battery started shooting away. The shooting became more intense and I decided to go have a look. Nobody else stirred or seemed to bother. I got up and put my pants and tunic over my pyjamas and had my second foot half into my Wellington boots when a thousand pound German bomb went off about 150 feet from our billet. Well my bed was four feet from the door and would you believe a dozen fellows beat me to the door. The dam guns had made Jerry think something of value was down there. I guess it was. . . not us. . . but our aircraft. . . yes, we lost one. . . burned to a pile of ashes and two engines. Here we were a new Bomber Squadron and Jerry's bomb cut us to half strength before we even got operational. We in 405 Squadron gave them back many a BIG BANG but we have to admit Jerry got the first shot .... he sure did. Glen's other recollection of Driffield was being in town for a movie on Saturday night and buying a pair of pyjamas that caught my eye in a store window. No big deal until I saw the headline of the Sunday papers which announced that clothes were to be rationed effective immediately and enlisted men's ration was zero. The pyjamas did last three and a half years until my return to Canada. We were at Driffield because Pocklington, the base we were to operate from, was being newly built and was not yet completed. Our time in Driffield was spent receiving new aircraft and adapting them to be operational. I believe we flew one or two operations from Driffield. These were in early days when there were still gunners with the rank of Leading Aircraftsman, flying as aircrew. It was not too long before all aircrew were promoted to senior non-commissioned officers which was Sergeant or higher. 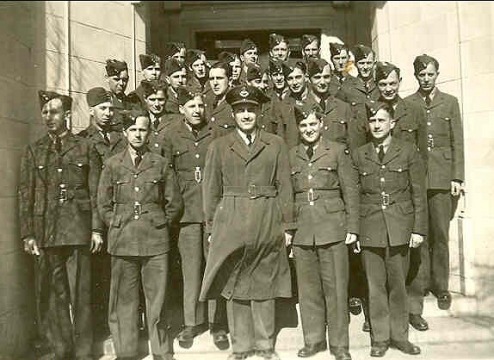 There were never any RCAF aircrew below the rank of Sergeant and to equalize things the RAF soon followed that rule. The main reason for aircrew being senior non-commissioned officers was that if they were shot down and captured their treatment by the Germans was considerably less severe in the prison camps than if they did not hold that senior rank. Glen here .... Our aircraft at Driffield were the same ones we had at Marham except for the engines. The Merlin engine had become famous through its use in the Hurricanes and Spitfires and we thought it an improvement over the radial Pegasus. Not so as the aircraft had been designed for the radial units. The reason that we had Merlins was because the factory that produced the Pegasus was in Coventry and ceased to exist after the famous air raid when the Nasty Germans bombed that poor little residential town. So much for wartime propaganda. The nearest good sized city to Driffield was a seaside town called Bridlington and it was close enough to get there after work any evening. Being a resort city there were a number of rides and we had great fun driving around in little bumper cars crashing into each other. There was also, in Bridlington, a school principal who had, many years earlier worked with Tom Cranston's father on a newspaper and still contributed to the paper Tom's father owned in the town of Midland, Ontario, with the result that Tom and I were at his home a couple of times for tea. In Britain, the canteens were all operated by the Navy, Army, Airforce Institute known as the NAAFI. Cigarettes were extremely scarce and to get them, when they were available, involved lining up and getting five Stars, five Players Weights, or five Wild Wills Woodbines, Which was the maximum allotment, I believe we were still in Marham when the first parcel of 300 cigarettes came to each of us and what a red letter day. The Canadian government agreed that there would be no tax on cigarettes sent overseas by the tobacco companies and instead of a penny each, which they were on the Canadian market, the tobacco companies would send us 300 in a package for each dollar sent to them. If the sender wished to remit $2.50, they would send 1000 cigarettes. Our Dad sent us 300 cigarettes a week which gave us all we needed. In addition, the folks in our hometown of Wolseley, Sask. raised funds for the men from the town in the services and two or three times each year we would get 1000 cigarettes from them. Additionally, once the Canadian YMCA took over providing us with comforts, movies, sports equipment etc., we would usually get a free package of cigarettes when we went to the movies so all in all, we had sufficient cigarettes to share them with the less fortunate RAF fellows with whom we worked. It took some months to get the flow of cigarettes coming and until we left Driffield we had received only one or two 300 cigarette packages which augmented what we could get from the NAAFI but cigarettes were still not plentiful. The scarcity in the spring of 1941 was blamed on the German submarines and the sticky fingers in the army post office which handled all Canadian service mail. Canadian cigarettes could be bought in many pubs, during this period, in London so there is a story there. It was not until June 20, 1941 that we moved on to Pocklington and until then we had a busy time in wireless section. 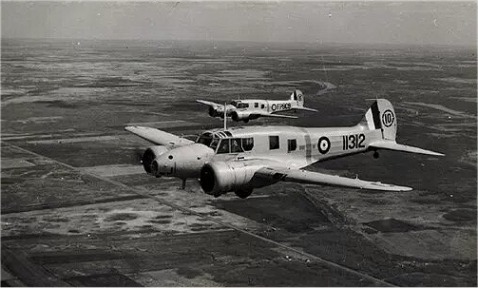 Not only did we not have a full complement of personnel but during that month, all the squadron aircraft were being assembled which meant checking out all the Wireless equipment as it came and installing the IFF (Identification Friend or Foe) the very first type of radar. It was a brand new device and the earliest aircraft came without it and it had to be installed with our assistance. It was no secret that it was kept under guard in the wireless section at all times that the aircraft were not on operations and it contained a detonator attached to a gravity switch which blew the device up if the aircraft crashed with the device in it. Once the IFF was placed in position the plug from the switch was inserted and we had two instances when the switch was not in the off position and it blew up in the faces of those putting in the plug causing substantial injuries and junking an IFF. Bob Ford and Glen are two I can remember and in the case of Bob, there was concern that he would be blinded but fortunately such was not the case. When we got to Pocklington, the Wireless section, the Electricians and the photographic section were all in the hut closest to the runway and were the only people to have their hut designated by the red light so we were referred to as the "Red Light District". Shortly after we got settled in, we acquired a Volley ball and net which we strung between our hut and the next and when the weather allowed, we spent part of our noon hours and our evenings playing volleyball. We became so proficient that we were the station champions and when we learned of a tournament at another Canadian airdrome in Yorkshire, we entered a team and won second place. That is the end of story that Sam (Merrifield) had written when he had the stroke on December 18th, 1987. He had no chance to edit or amend it and I have typed it faithfully as my skill permits. After the 40th Anniversary Reunion of the Battle of Britain in Toronto in 1980 I wrote a few friends and accumulated a few anecdotes for the record. Sam contributed to these and I shall put his offerings into my narrative in the proper order and identify them. There will be similar stories of others. Sam's memory is still keen but his vision and other ailments will not let him continue. Therefore my efforts must suffice but I shall check with Sam to see my 45 years of remembrance are not too faulty.